Ok, so I know it's been a long time since I updated my blog. So lengthy my silence has been that even my own mother phoned me up yesterday to ask me when I was going to provide the next instalment of my life. "Sorry, mum," I sighed down the phone. "I've been pretty busy this past month." She tutted back at me, giving me the distinct feeling she was telling me off and sending my memory into some strange timewarp where I appear to be a teenager again. "I know you've been busy, love, but the least you can do is update your fans. They'll all be wondering if you're still alive!" Fans? My mother thinks I have fans! What a blast! 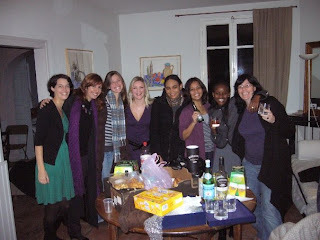 I spent a month at a TEFL (teaching English as a foreign language) teacher training school in Tournan-En-Brie. This meant that I had to stay on campus and left my two boys (FP and the cat) to fend for themselves. I went home every weekend, of course, and was half disgruntled and half contented with the evidence that they clearly cannot survive without me. There were piles of dirty dishes in the sink, several thousands of dust bunnies / tumble weed-like creatures / moutons (sheep) blowing around the wooden floors and I walked past the same blue sweater strewn in a random heap on the living room floor every weekend for the entire month. The cat was also clearly missing me as he had taken on some strange behaviour - willingly curling up to FP and begging to be stroked. This is so not Ollie behaviour, this is the behaviour of an affection-starved cat. Normally, he wants nothing to do with us. He's been in his teenager phase (the phase where he wants nothing to do with his mum and dad and thinks he's too cool for cuddles) for most of his life now and it's surprising to see this change in him. He had also shredded one of the dining room chair seats to pieces with his claws. To be honest, the apartment looked as though a nuclear bomb had hit it. Twice. I'm not sure what happened to the old FP. There was a time when he lived by himself and managed to get through his day to day life without much of a problem. And then we moved in together and I think I may have spoiled him...now I'm paying the price. I'm not sure whether he does it deliberately but he seems to have forgotten how to pick things up from the floor. I've tried experimenting, I dropped a pair of his socks on the kitchen floor once and left them lying there for days. It's not that he didn't notice them - he did - he even mentioned the socks in casual conversation ('why are my socks on the kitchen floor?'). But he didn't pick them up. It just didn't seem to occur to him. He walked past them, stepped around them and over them for 3 feckin days before I fell to my knees and cried 'But WHY?!' to the world in general. FP also has trouble remembering how to cook. Gone are the days when he would whip up delicious meals for me when I came to visit him in Beauvais. Ok, so they weren't exactly gourmet meals, more like pasta in a homemade tomato sauce, but at least he managed that. Now he burns pizzas to a chargrilled crisp and closes the door when the grill is on, followed by a mass panic when he can't see 5 centimetres in front of his face because of all the smoke. Before I left to go to the teacher training school we both agreed that the safest option would be to stock up on ready made microwave meals and tins of beans and sausages. Can't go wrong with that, right? Wrong. FP phoned me up one night while I was studying and, sounding very sheepish indeed, explained that he had been too adventurous and had now had a slight calamity on his hands. He had decided to make himself pasta that night, but somehow - and I will never, ever understand how - the water disapeared when he was boiling the pasta and the whole thing turned into a black, scorched mess, clinging to the pot with a death-like grip. There was not a piece of pasta in sight. FP seemed in shock and kept repeating down the phone 'penne rigate was too ambitious, penne rigate was too ambitious'. (For my own amusement I imagined him rocking back and forth in the corner of the kitchen as he said this.) In the end, the pot had to go in the bin because even after hours of chiselling away at the blackened pasta remains, there was no saving it. I have never seen anything like it in my life. So yes, evidently FP and Ollie missed me. And I certainly missed them while I was away. The TEFL course was brilliant and I don't think I have learned as much as I did that month since...ever, but jeezus it was intense. We were up in the morning at half past 7 and got to bed at half past 2 in the morning. For a month. But apart from the intensiveness (is that a word?) and the horribly difficult exams and projects, I really enjoyed myself and found that I love teaching. We practiced teaching using victims- I mean guinea pi- I mean willing participants from the village of Tournan which was quite interesting. Some of them had been coming for years and others arrived at the same time as we did. It was nice to be able to teach all the different levels and a wide variety of ages and what I loved was seeing the student's progression as the weeks went by. Though I won't mention Pierre who has been coming for four years and is still in the beginner's group and has trouble even asking somebody what their age is. One of the great things about the teaching course was the friends that I made. There were 10 of us, all from different countries and different backgrounds but we all got on so well and by the end of the course I knew these were good people that I wanted to stay in touch with. Some of them have discovered La Belle Saison so I shall just give a wee shout out to Rachel, Grace, Nicole, Ambiga, Daniel, Luke, Anne, Brittany and Olivia. Hi guys! So yes, folks, the course was a success and I am now a qualified English teacher! High points - my lesson on 'a holiday in Scotland' with the beginner's group where I pulled out all the stereotypical stops to hold their attention (wore a mini-kilt, played bagpipe music, talked about Nessie, provided shortbread...). Even Pierre managed to learn something and it was hilarious listening to the students trying to pronounce 'Edinburgh'. I think I have found my ideal career. I love the sock story ! Actually my dad used to do the same thing : when he saw a sock on the floor, he didn't take it ; he let it on the floor for days, and so did we (me, my bro and my mum). When one of us said "there is a sock on the floor", he said "I let it here just to see if one of YOU would take it". But the problem is, that's what we also did : we waited for HIM to take the sock. You do too have fans! Hey, you are world famous, literally!! I, myself, have introduced scores of people to you. The sock story IS hilarious, and completely believable. I won't get into who is more rabid about cleaning in our house (except to say that it's me) but I am certain when Micah reads this she will get an intense kick out of the Phoebe reference. Congratulations on getting a pass to be kooky and weird! Now your behavior is (somewhat) endorsed!! Oh, and just to drive you nuts, I would pronounce it "Edenburf". Smelly cat, smelly cat, what are you looking for??? TD is correct. Loves it! And yes, you have fans! Léa haha! It surely has to be a man thing! And then when we question them about it they try to say that they were leaving it there deliberately so as to see if WE were going to ever pick it up! Oh la la! Why mister TD Thank you ever so much for saying I'm world famous, you're stroking my ego!! Kristan Yeah in the UK we are very into animal rights, but the French, it appears, not so much. It's a shame really, because there are more French people who own pets than British people. Doesn't add up! Ghosty Oh! A noble profession, I like that a lot! Can I use that in future references to me being a teacher? Loth yes to calling me 'Miss'! Makes me feel young and teacherly! Just found this here blog - congrats, it's a fine endeavour. I'm your fellow Edinburger (well, born there anyway) and your old TEFL course trainer. I hope things are going well for you, and thanks for entering the competition for the book - there's another one just up - why not go for that one too and tell all your friends or colleagues at least. We've had some interesting groups since yours, and two courses had heavy snow as part of their Tournan experience! Well, that's all for now. Seems like you're getting married soon - good luck!